University of Strathclyde Glasgow has opened Strathclyde Business School Dean’s Excellence Awards 2018 link for undergraduate student. As per latest official Notification, This scholarship Scheme is awarded to students who are holding a conditional or unconditional offer to study at the University of Strathclyde Glasgow. Applicants whose profile matches these eligibility criteria they don’t miss this golden opportunity and apply online for Strathclyde Business School Dean’s Excellence Awards 2018 before the last date through the link which is mention at the bottom of the page. 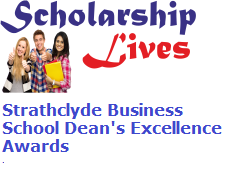 Strathclyde Business School Dean’s Excellence Awards Amount 2018 provides GBP 2,000 per year. Contenders should hold a conditional or unconditional offer to study at the University of Strathclyde Glasgow. Courses offer to study in one of the following: BA Business, BA international Business, Integrated Master International Business and Modern Languages. Applicant can click here to open the application page.